Instantly replace your tape backup with UBD for faster, more secure backups and restores. UBD is an all-flash appliance that plugs into your IBM i instead of your tape drive and supports the same CL and backup commands you are already using. Built in deduplication and replication simplifies your backup process and increases your Disaster/Recovery protection. UBD supports backup for IBM i, Linux, AIX, and Windows servers. UBD is also available as a Windows VM. UBD with All-Flash takes bogged down tape backup operations and supercharges them. Compared with using tape, data recovery becomes a simple task completed in a fraction of the time restoring from tape requires. Granular recovery, combined with the use of SSDs, gives you the ability to recover files in seconds. UBD is now compatible with VMware, Microsoft Hyper-V, and other popular hypervisors. A dedicated server for UBD is no longer required. With the VM integration option, businesses save by not having to invest in new hardware, the only purchase being the UBD software which comes with the necessary Fibre Channel card. To see more, check out pre-recorded live webcasts here. Use our Universal Backup Device (UBD) for faster, more reliable daily backups and restores via SAVLIB/SAVOBJ, Save 21, BRMS, Robot/SAVE or any other backup software package without programming changes. Using your current tape commands makes using UBD easy to implement and easy to use. Instead of getting up to retrieve and load one or more tape cartridges, you can use the UBD browser-based interface to create and load a new tape image before backup, eliminating all of the manual processes involved with the physical handling of tapes. Considering using UBD for backup and restore? See just how easily you can do it with UBD. For a limited time, receive a $50 Amazon gift card when you see the live on-line demo. UBD backups are much faster than tape. Restores are also faster. Partial restores of individual libraries or objects can be many times faster, because the restore command does not have to seek sequentially through tape media. Instead of taking half an hour to read the tape, the restore can take thirty seconds in some cases. LaserVault has increased Fibre Channel write throughput with UBD to an amazing 409MB/second. See how this compares to tape backup here. If you want the fastest backups for your IBM i, then use UBD to backup to SSD. With speeds of up to 500 MB/sec, you can significantly shorten your backup windows and get quicker access to your data with the fastest recovery speeds. Many industries require tape backups for auditing purposes. Get UBD with the Tapeout Option and you can still get the benefits of UBD for your on-site backups, including faster backups and restores with a much simpler backup process and keep tapes for long term and archival storage to satisfy regulation. 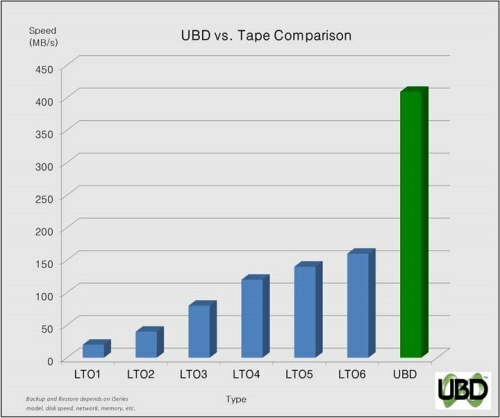 Here are 10 reasons to add UBD to your tape backup process. Save your backups to your off-site DR location. A wise man once said, “You never know a tape is bad until it is, and then it is too late.” With UBD you get peace of mind knowing your iSeries backups are reliable, complete and secure in the event of a disaster. Even a small data loss can be devastating. 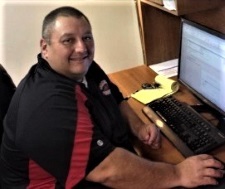 Ensuring that your backups are current, complete and quickly accessible can make the difference between whether or not your business survives. UBD can help you ensure that it does. Learn more by requesting our white paper: Disaster and Data Loss – How Disk Backups Can Best Save Your Business. UBD can also be used as a gateway device to store backups on your NAS, SAN or any deduplication appliance, such as NetApp, Quantum, Exagrid, EMC Avamar, and Cohesity. UBD is also compatible with all iSeries or AS/400 cloud backup solutions that support Windows files. Automated backups eliminate the manual processes and costs of tape. UBD allows you to automate your iSeries or AS/400 backups so they can be managed from anywhere because there are no physical tapes involved. UBD gives you a fast, reliable and secure backup solution at an affordable price. As a comparison, check out our Cost of Tape worksheet to determine how much you may be spending on your tape backups. UBD also supports CL commands for automating the tape image creation and selection from the IBM host side. 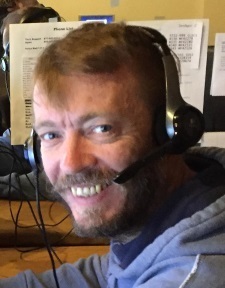 It’s like a Virtual Tape Library (VTL) without the complicated software, operation requirements and high cost. How much does using physical tape for your data protection cost your company? We used our cost of tape worksheet to show you what one company was spending. Here are the results. Simple installation takes minutes. Our customers are amazed at how easy installation is. Unplug your iSeries or AS/400 tape drive and plug in UBD. Most customers are able to install UBD in under an hour. Training is simple because UBD does not require programming changes from your current IBM i backup processes. 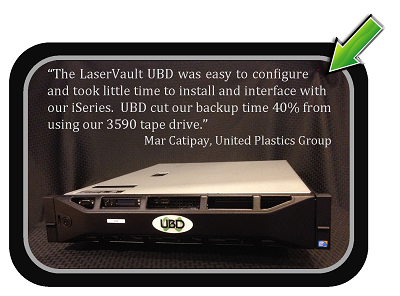 UBD is perfect for any size business, for any size backup and for any size budget. If you currently have an iSeries, AS/400 or System i, UBD is available in a variety of configurations to meet your business needs and your budget. And UBD doesn’t care about the size of your backup. The size is limited only by your storage device. Take 30 minutes and let us show you a quick UBD on-line demo. See how you can speed up and simplify your backups and receive a $50 Amazon gift card when you see the on-line demo. Schedule a time that is convenient for you. All it takes is 30 minutes. LaserVault Solutions are also available through our Reseller Partners around the globe.